If the vessel encounters a dangerous situation that may develop into an emergency, it is extremely important that the whole crew know exactly what they should do to save their lives and minimize damage. The crew must be drilled to take certain actions more or less automatically. However, nobody must act without considering the superfluous consequences. These plans should be used actively during emergency drills. The possibility of a leak from a loading arm due to tidal effect is remote. However, a leak could be caused by excessive movement of the vessel whilst alongside. 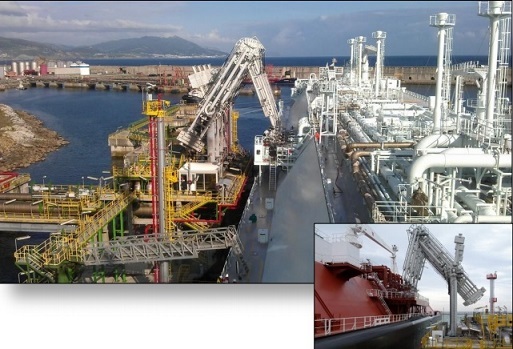 The loading arms are designed to accept a certain movement of the vessel, if the movement exceeds certain limits ESDS is activated and all cargo operations are stopped. If the vessel's movement increases even further the PERC system is activated and loading arms are disconnected immediately. v) Make ready Dry Powder Fixed Fire-Extinguishing System. Normally ready while alongside. 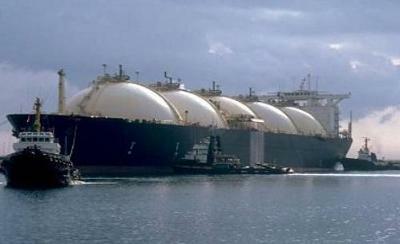 Boiling of LNG is rapid, due to the large temperature difference between the product and water. LNG continuously spreads over an indefinitely large area, it results in a magnification of its rates of evaporation until vaporization is complete. No coherent ice layer forms on the water. Under particular circumstances, with a Methane concentration below 40%, flameless explosions are possible when the LNG strikes the water. It results from an interfacial phenomenon in which LNG becomes locally superheated at a maximum limit until a rapid boiling occurs. However, commercial LNG is far richer in Methane than 40% and would require lengthy storage before ageing to that concentration. The flammable cloud of LNG and air may extend for large distances downwind (only Methane when warmer than 100 degree C is lighter than air) because of the absence of topographic features, which normally promote turbulent mixing.